We don't do it just because we're news junkies who have to know every detail of world affairs. We do it more because we're readers —and because you asked us to look at this one. Generally, like we already discussed, once you've set up a newsreader app, you just open it and the headlines of every site you like are right there. Skim those headlines or maybe check out a little summary if you're curious. When you hit something you want to read in full, read it in full. You can read it right there in the newsreader. So instead of going to a dozen or a hundred websites and checking if anything's been added, you can see exactly what's new on all of them. 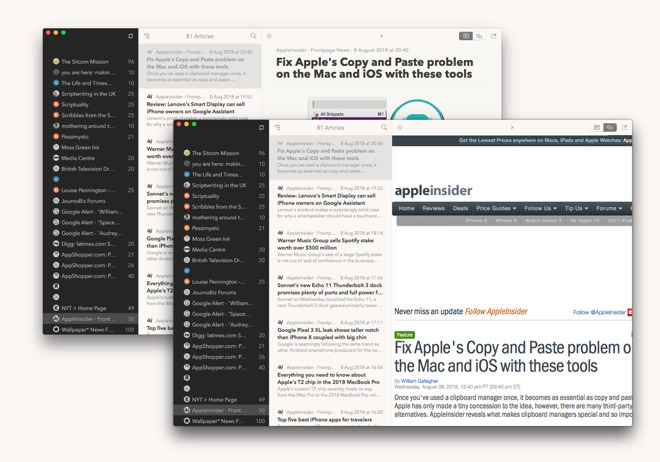 You can read every article from every site. In theory, your only limit is the amount of time you've got to spare. In practice, there are couple of other limits. One that Cappuccino deals with superbly is how all of this looks. Design is important both because you're going to be reading this so it should be a good experience and because it's complicated. Your newsreader app may have to display thousands of different articles yet make it a pleasure to go through instead of a chore. Then there is also the question of how you tell it what news you want to read. Cappuccino helps you out there by really just postponing the question. On installation, it comes with a series of first-class news and interest sites already plugged in to it. Click on a site, click on a headline and you can read the whole article in a Reading Mode-like way or click to see the full web version. By the time you've exhausted the list that comes with the app, you're used to the whole idea and adding new sites isn't as daunting. If you just want to add one site, it's a question of clicking on the Feeds menu, then choosing Add Feed. You enter the name of the website whose news feed you want to read. 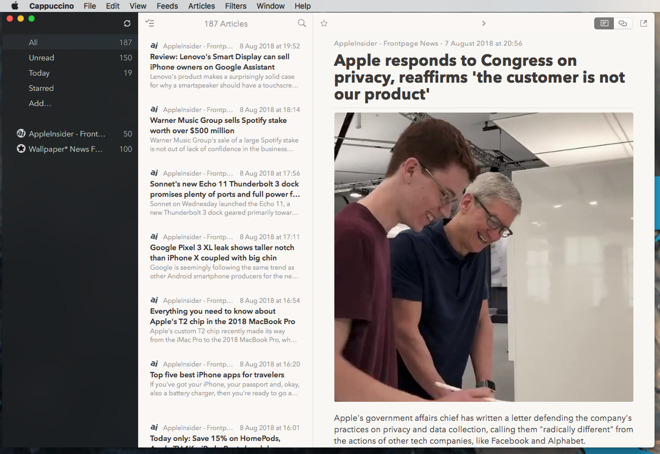 Cappuccino adds it to your list and from now on, you're reading that feed whenever you want. However, Cappuccino is so sure that you'll add more than one site that it gives you the option of creating folders. It lets you group feeds together so, for instance, you can have all your favorite football and baseball websites in a folder called Sports. Adding a lot of sites one by one is a tedious business, though. So Cappuccino gives you the option of importing a list all at once. The list has to be in a format called OPML which many newsreaders support. 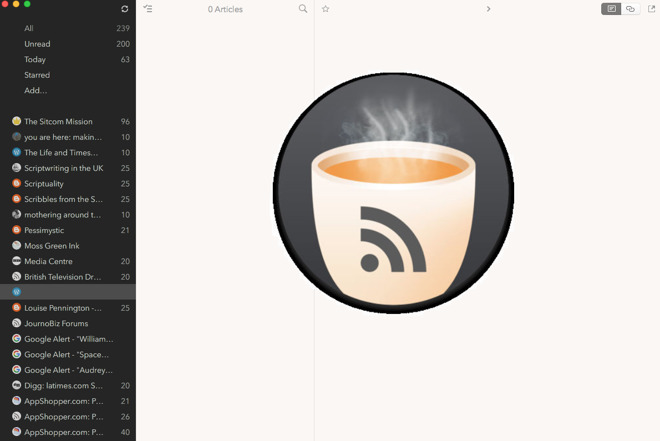 Cappuccino will export your list of news feeds in this format, for instance. If you've already got one then the odds are that you're moving from another newsreader. The odds are that you're used to how these apps work and if you're obsessive enough to keep trying new ones, then you probably have a lot of favorite news feeds. That's where Cappuccino goes wrong. We imported a large OPML list of sites and Cappuccino took them all in, displayed them all - and got some wrong. One blog we follow in our news reading apps is called Love. Bake. Learn. Make. Laugh. by writer Alex Townley. Cappuccino truncated the name to "Love". Then with it and very many feeds we'd added, it would say something like there were 10 unread articles but then wouldn't display them. That's understandable while it's working away importing all of this text but if you tried to click in to one, it would say there was nothing there. So you'd have a count of 10 and a presence of 0. We were importing around 300 news feeds so the odd hiccup or delay is expected. What wasn't expected is that the next day we opened Cappuccino, it had forgotten all 300 of them. Anything we'd added one-by-one was fine and anything already in the app was still there but the imported lot were gone. We did reach out to support but the company uses an online chat service and the person we started to speak to went away before we got to any of this. 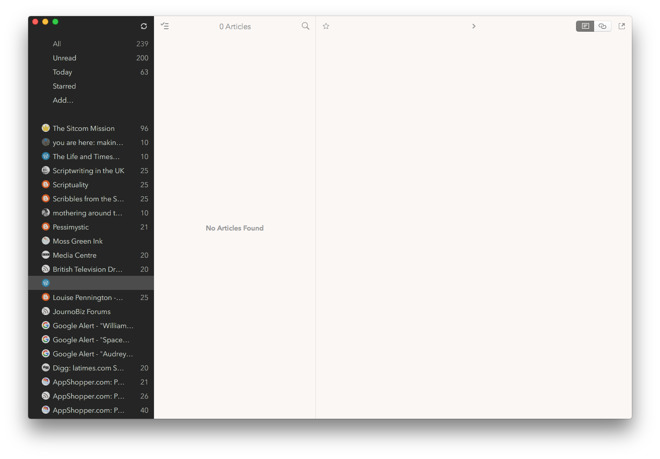 Cappuccino does look very good —though it is uncannily similar to the more powerful and robust Reeder 3 —but it feels lightweight. It has folders and the ability to import many feeds but it doesn't feel finished. There's no option, for instance, to Hide Cappuccino so it's not an app you tend to leave open in the background. Still, for reading the sites it offers, it's good. For adding the odd one to it, it's fine. For serious news reading though, it just doesn't yet get there. Cappuccino is free on both the Mac App StoreMac App Store and the iOS App Store. There's an Cappuccino Premium option which gets you a daily digest email of your news feeds plus push notifications of selected sites. That costs $0.99 per month or $9.99 per year. Cappuccino requires macOS 10.12 or iOS 11 and higher.